It was fitting that President Barack Obama’s final press conference of the year, and perhaps his presidency, was dominated by war, both ongoing and future. Obama is the first US president to serve two full terms in office with the nation at war. He will relinquish his position amidst a deepening disaster in the Middle East and a frenzied campaign in the media and the political establishment for aggression against Russia. 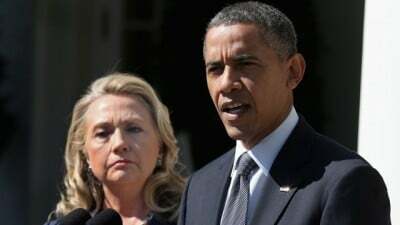 The press conference marked an escalation of Obama’s stated position on the alleged hacking of Democratic Party emails during the presidential election campaign. He reiterated the unsubstantiated claims of US intelligence agencies that Russia was behind the hacks, while asserting that Russian President Vladimir Putin almost certainly approved the operation. At the same time, Obama made light of the content of the leaked emails, branding as “campaign gossip” emails showing that the Democratic National Committee and the Clinton campaign conspired to sabotage the primary election challenge of Vermont Senator Bernie Sanders, and others that included transcripts of groveling speeches given by Clinton to Wall Street banks, for which she was paid six-digit fees, and which she refused to release to the public. He criticized the establishment media, which downplayed the content of the leaked emails during the election campaign, for even the minimal reporting it provided. He flatly refused to cite any evidence, claiming that this would jeopardize the ability of the US national security agencies to respond to future cyber attacks. That none of these claims have been substantiated was of no concern to the assembled representatives of the corporate media, many of which have been participating in an all-out anti-Russia propaganda campaign. Instead, Obama was on the defensive about the failure of the CIA-backed regime-change operation in Syria, with the president insisting that the only alternative to his policy of supporting “rebel” proxy forces was an Iraq War-style invasion and occupation of the country. Amidst a raging conflict over foreign policy within the ruling class, Obama was at pains to patch over differences in what he referred to last month as the “intramural scrimmage” within the political establishment. He went out of his way to defend both the CIA and the FBI, the former against criticism that its claims of Russian hacking to favor Trump had not been verified with evidence, and the latter against claims by Democrats that its intervention into the campaign on the issue of Hillary Clinton’s use of a private email server, 11 days before Election Day, played a critical role in tipping the outcome toward Trump. He presented the two agencies as patriotic, disinterested and professional, although the CIA is the most notorious assassination force in the world, and the FBI is notorious for its role in domestic repression. Obama gave the press conference only hours after reports that FBI Director James Comey and the director of national intelligence, James Clapper, have now embraced the CIA finding that the alleged Russian government hacking in the 2016 election was motivated by a desire to help the Trump campaign. CIA Director John Brennan issued a statement to that effect in a message to the CIA workforce, rebutting media claims that the FBI and CIA had reached different conclusions about the hacking. Hillary Clinton also weighed in directly in the escalating propaganda offensive against Russia, telling a group of campaign donors in Manhattan Thursday night, according to an audio recording leaked to the New York Times, that her election defeat was due to the combined effects of Russian hacking and the FBI announcement of a renewed investigation into her use of a private email server while secretary of state. Clinton characterized the alleged Russian hacking as “an attack against our country,” language that opens the door to full-scale retaliation by the US government, either through cyber-warfare or some equally incendiary step. Obama spoke in similar terms, suggesting that US retaliation against Russia might be in part public and in part covert, involving measures that the Russian government would feel, but of which the public would not be aware. He stopped short, however, of the position of Clinton campaign chairman John Podesta, who in a Friday op-ed in the Washington Post declared that “the administration should brief members of the Electoral College on the extent and manner of Russia’s influence in our election before they vote on Dec. 19.” Asked directly about Podesta’s call, Obama avoided the question of what the Electoral College should do next Monday. Perhaps most significantly, Obama played down any conflicts with the incoming Trump administration, while repeatedly characterizing his frequent conversations with Trump as cordial and respectful. He parried questions about whether Trump’s tweets and other public comments, criticizing the CIA for its statements about the hacking, had encouraged Putin or damaged morale in the intelligence agencies. This is in keeping with his overall posture of overseeing a “seamless transition” to the incoming Trump administration. He boasted that Trump and his aides could have no complaints about the cooperation they were receiving, and he flatly refused to engage in any discussion of either the policies or the personnel of the ultra-right administration that is being assembled in meetings at Trump Tower. Throughout the press conference, Obama seemed unconcerned with the fact that he is leaving office in just over one month under conditions of unprecedented global and domestic crisis. That the United States is on the verge of sparking a conflict with Russia, the second-largest nuclear power in the world, was pursued by neither Obama nor the White House press corps. Obama began the press conference with a lengthy description of the alleged successes of his administration, painting a picture of an America that would be unrecognizable to the vast majority of working people. Obama cited the low official unemployment rate, claimed that wages were rapidly rising, and boasted of a tripling of the stock market to argue that the American people were far better off than when he took office. He avoided any mention of the multiple indices of a devastating social crisis—declining life expectancy for large sections of the working class; the destruction of millions of decent-paying jobs and proliferation of low-wage, temporary employment; growing homelessness; rising suicide and addiction rates. Nor did he note the record increase in economic inequality during his presidency. No one in the subservient press corps sought to dispute his delusional presentation, or ask Obama to explain why the outcome of this supposed eight-year success story was the victory of Trump and defeat of his chosen successor, Hillary Clinton, along with crushing defeats for the Democratic Party in the House of Representatives, the US Senate and state governments. The truth is that Obama, by coming to the rescue of Wall Street in 2009 and making the defense of its interests, both at home and abroad, the lodestar of his administration, dashed the hopes of the millions of working people who voted for him in 2008, and more reluctantly in 2012, and paved the way for a government, comprised of billionaires, ultra-right ideologues and retired generals, that will be the most reactionary in American history.